The staff and Dr. Connorton were so friendly and helpful! Love going here. Great visit! I got a scratch on my eye and they saw me immediately. Very quick and very professional. They gave me a temporary contact, a prescription for eye drops and I was back at work in about 30 minutes. I was worked in, as a new patient, on a Friday afternoon with an eye emergency (to me, having never experienced such, before). The staff was very helpful in getting me registered, insurance checked, appt. made, and more. Dr. Connorton patiently heard my concerns and performed a comprehensive exam of the eye. Since my previous optometry clinic (with loads of optometrists) felt it was easier to blame me for not scheduling my emergency to occur before 11:45 a.m. on a Friday, and had no option for me but to wait for an appointment during the following week, I will be moving my care to Dr. Connorton. After not returning for 2+ years the staff informed me my dr had left and a new gentleman had taken over. I, just wanting to replace my lost glasses, didn't care and got scheduled. I found this visit just as pleasant as any other, the dr was nice and we joked and chatted and discussed recent travels while he thoroughly checked my eyes. He mentioned I could get bifocals now but don't need them quite yet, and just come on back when I notice I can't read at a certain distance - I felt informed and forewarned but it was up to me what to do with the information. When it came time to get my new glasses selected the staff told me what my insurance covered and helped me find frames that best fit my face, and did not just lead me to the most expensive as I am always suspicious someone might be tempted to do. I found a great pair of glasses almost fully covered by insurance, and they explained all my options (anti-glare, transitions, lens types) quite well. My husband was with me since we knew I likely needed my eye's dialated, and he now has his own appointment because of the continued good experience I had. I've been going to these guys along with my whole family for over ten years. I've never had a bad experience there. I just made another appointment with them today. I will continue going to them and highly recommend them. We take pride in building lasting relationships with our patients - We take the time to get to know you from vision requirements to lifestyle needs. We carry the best polarized sunwear around! We know what is pleasing to the eye both in fashion & vision. Shenandoah Eye Clinic's optical section carries even high-end designer brands. Discover prescription glasses & sunglasses from major brands & collections in a variety of styles, colors and materials. Dailies, weekly or monthly disposable lenses are available to suit your visual needs. Digitally imaging of the eye can detect early signs of eye disease and prepare for surgery. 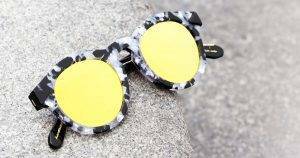 We now carry Krewe Du Optic Eyewear! With an office in Baton Rouge, Shenandoah Eye Clinic serves Greater Baton Rouge and surrounding areas – schedule an appointment today. If you have a moment, please give us your feedback about our site and your experiences at Shenandoah Eye Clinic. Discover how luxurious and easy shopping for eye wear can be right here in Baton Rouge with Shenandoah Eye Clinic. Our contemporary showroom accented with slate and stunning granite lets you browse all the popular and designer frames and contact lenses in comfort with your personal optician. Schedule an eye exam with Dr. Lawrence Aderhold or Dr. Bridgette Connorton or try on the latest sunglasses of the fashion season. With the skilled staff at Shenandoah Eye Clinic you will look and see in style.